Oh baby! Nina was just hit with Offspring's biggest twist yet. Oh God, NINA IS GOING TO HAVE PATRICK’S BABY! Sorry, let’s back it up and start at the very beginning. Nina is dropping little Zoe off at her first day of day-care and like every first time parent, she’s hesitant to leave her tiny human. But Zoe seems pretty happy to play with the other kids and in reality, Nina really can’t stick around too long. She’s got that whole “wrong baby sent home with parents” drama to worry about at the hospital. In fact, babies are the root of every little bit of drama in this episode of Offspring, evil little troublemakers that they are. First up, Kim tells Zara that she and her wife are thinking of having another baby and that, if possible, they’d like Jimmy, Zara’s husband and current Uber driver, to provide that extra ingredient they need to make a baby cocktail mixture complete. Zara, apparently, is thrilled to offer up her husband’s sperm like it’s a cup of sugar and for a moment, all seems fine and dandy in this baby maker arrangement. That is, until they consider the feelings of Clegg, who graciously helped them out with the conception of their first child. Kim confides in Cherie what she plans to ask Jimmy and right away. Cherie knows that her lover is about to have his feelings crushed. After all, he feels like he is the only one who has the “magic potion” to give Kim a baby. Instead of sitting Jimmy down and asking him privately, Kim and Zara decide to spring this announcement on him in front of all their family and friends. Zara and Kim can barely keep the grins off their faces as Kim makes the public request. And the reactions are swift and brutal. Clegg assumes at first the he is the chosen sperm donor and when Cherie breaks it to him that “they don’t want you” he throws what can only be described as a tantrum. It’s okay, Clegg, I’m sure your sperm is fantastic. They don’t know what they are missing. Jimmy is at first speechless, and then a dumfounded look crosses over his face as he realises exactly what is being asked of him. Poor guy, all he wanted to do was eat some leftover tacos with his friends and now he finds out his wife wants him milked for sperm so she can pass it out to her friends like extra salt on a margarita glass. Hot tip: if you ever want a party cleared or just get people the hell out of your house, have one of your friends request another friends sperm. According to this Offspring episode, it works a treat. Thing get even more awkward the next day when Jimmy and Zara have it out about the whole “sperm donation” thing. Zara seems genuinely shocked that Jimmy is upset by the fact that she offered up his personal man juice to their friends, and he’s offended that she thinks he could father a child and walk away from it. Back to the hospital baby drama and Nina is DNA testing the parents who think they might have scooped up the wrong baby on the way out of St Francis. The mother confides to Nina that the baby is definitely hers……..but may not be her husbands. Now, Nina has a way to get St Francis out of this swapped baby crisis mess. She could urge the mother to come forward and say that infidelity is the cause of the family heartache, not a hospital mess up. In the end Nina takes the high road and graciously tells the woman “we need to look after you, after all of you”. Her act of kindness is awarded by the heavens above. The baby turns out to be with the right parents and St Francis is off the hook. Just when you think you can chalk this episode up to a few mild sperm/baby DNA hijinks, Offspring throws in another big twist. Waiting in Nina’s office, is Patrick’s ex-wife, Jodie. She asks if Nina is single and when she gets a response, launches into a startling story about Patrick’s sperm. It turns out poor, lovely, no longer with us Patrick had some of his sperm frozen and stored in Melbourne. It’s there, available and waiting for Nina if she wants to use it to have another baby. Nina is floored and it’s not surprising. She thought Patrick was gone forever and now she has the chance to have another part of him with her. What will she decide? Hurry up, Offspring, we need to know. Missed out? 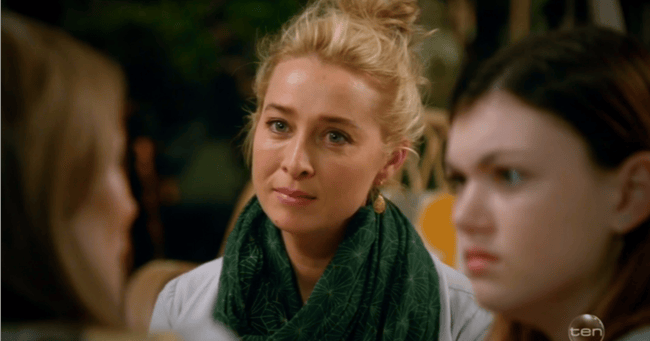 Here&apos;s what happened on Offspring last week.